Located in the upper Valley of the river San Lorenzo, you will taste an excellent olive oil visiting this village in Liguria, Italy. Boscomare was built underneath an ancient tower in the middle of an olive grove. Every visitor to this small and quiet town will be transported to a world far away from the hustle and bustle of the daily life. Enjoy the tranquility of the mountains, the breathtaking view over the olive groves and fresh breeze from the sea and mountains. If you go a little bit further along the road running though Boscomare, you will find small blossoming lavender fields. Because of the idyllic mountains, Boscomare serves as a good starting point for exploring the Blumenriviera. 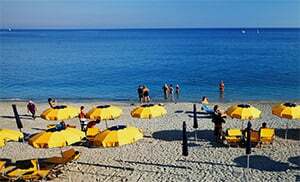 In just a few minutes, you will be able to reach interesting locations for excursion; for instance the witches’ village of Molini di Triora and the beach of the popular sea resort of San Lorenzo al Mare are only 10 km away. Boscomare is also a prefect starting point and destination for hiking and mountain-bike tours. One can admire the excellently and marvelously well designed mural paintings, as well as the Saracen tower from the 15th century when taking a stroll through the historical lanes. Boscomare was for a long time under the jurisdiction of the Archbishop of Genoa. The external walls of the ancient church of St. Bernhard date back to that time .There is a wooden statue of St. Bernhard in that church, which is supposed to remind us of the battle between good and evil. If you take time to stroll through the churchyard, you will also see the Loggia with two round arches. Boscomare is one of the hamlets in the province of Imperia which lies in the Liguria region. There are other hamlets near Boscomare, such as: Pietrabruna (4.3 km), Lingueglietta (3.8 km) and Civezza (13.6 km). When coming from the direction of San Lorenzo al Mare, take the SP45 and drive for approx. 9.8 km towards Boscomare.